¡Adios, Andy! 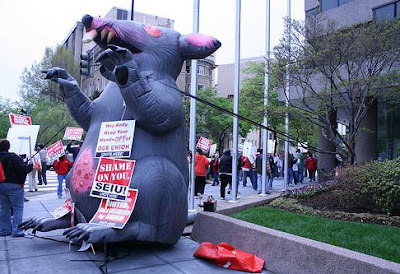 : SEIU Attacked By Giant Zombie Rat! Film at 11! It seems that The Big Rat wants a piece of The Big Cheese. Is it my imagination, or are more protests being held against SEIU than incidences where SEIU is actively protesting against someone else? They must be developing a bunker mentality in Dupont Circle. Do we have to insult the rats? Ok, nobody likes rats, but unlike Andy Stern's organizers they're not exactly making failed moral choices. Rats are unwelcome at hotels, but they're certainly not there to bust the hotel workers' union.